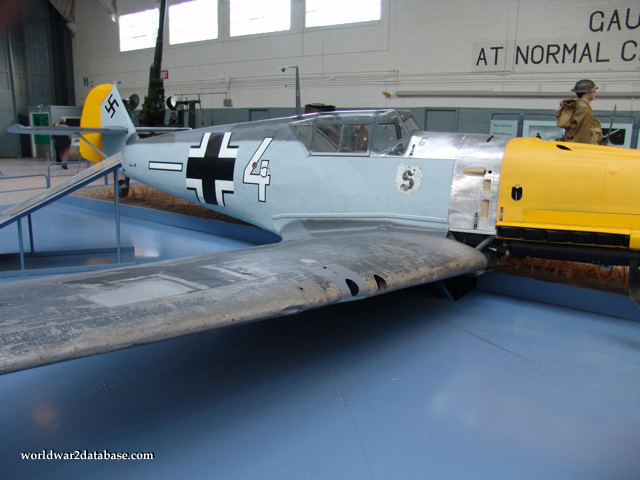 This Messerschmitt Bf-109E-3 serial number 1190 belonging to the 4th Staffel (squadron) of Jagdgeschwader (fighter group) 26 (4/JG26) was flown by 22-year-old UnterOfficier Horst Perez from Marquise-Est in France on September 30, 1940 when he was shot down by Sgt. Kingsby of RAF 92 squadron flying a Spitfire over Beachy Head and belly-landed wheels up at East Dean, near Eastbourne, Sussex. Perez surrendered to P.C. Walter Hyde and the local Home Guard, who shot Perez in the hand and jaw while he was surrendering. The aircraft was was sent to Canada for evaluation. While there its original engine was lost. Originally Gruppenkommandeur Karl Ebbighausen's aircraft, he was also shot down in another Bf-109E-4 on August 16, 1940. His five victory markings are marked on the tail, two Dutch aircraft, one french, and two British. 1190 was manufactured in Leipzieg on September 18, 1939 as a Bf-109E-3 with a Daimler-Benz DB601A engine. Later it received the DB-601N, a more powerful engine, upgrading its version to 4/N. This view shows the half of the aircraft that has been restored. The other side was left in the 1940 paint. You can see some of the 1940 paint on the wing.